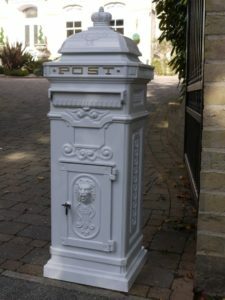 Post Boxes are very popular & are now found at most Weddings. Although they look great & can fit in with your theme they provide a more practical solution. Gone are the days when Wedding guests buy the happy couple crockery, white goods, cutlery sets, crystal glasses & many other pieces of unwanted tat. The modern way is a card containing a cash gift, tickets or vouchers for a chosen shop/travel agency. This then creates a headache for the couple as they need a place to be kept safe. A post box has filled this need very well over the years & allows you to get on with enjoying your event without the worry of cash gifts floating around the room. The White Post Box is our most popular one for Weddings & can be colour themed with ribbon matching your Wedding Theme. It’s a Victorian Cast Aluminium with dimensions W35 x D31 x H100cm. So approx 3ft tall & looks fantastic on top of a table which is the perfect height for most adult guests. 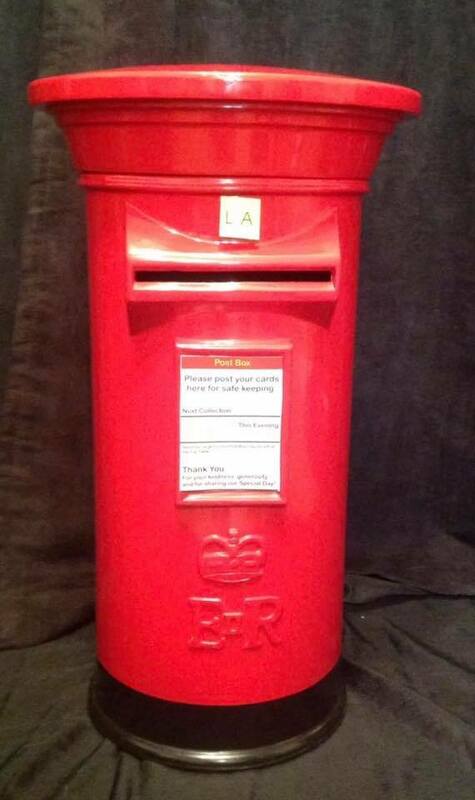 The Royal Mail Red post box is made from Fibre Glass & is approximately 2ft tall. It has a lid that sits on top that swivels to lock it in place. We hire this out to Birthdays & Charity Nights generally but some Couples love it for their Wedding more so in the Winter months. We can print off a personalised card with your names on it, date of next Royal Mail Pickup etc… for the fun element. Both boxes are in demand so I recommend you add them onto your event sooner so they are available. Remember if you have already spent over £899 you will save an additional 25% on this & any extra services you add here on out. Why not add a Post Box to take away any worry. I would highly recommend for Weddings in particular as these type of events you see a lot of cards containing money in them.